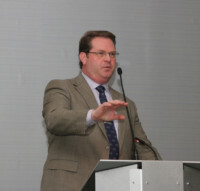 Eric Hamelback, chief executive officer of the National Horsemen’s Benevolent and Protective Association, is developing a concept he believes would help stewards navigate the increasingly complex world when highly sophisticated testing collides with environmental contamination and the inadvertent transfer of matter to racehorses. Speaking Friday on the last day of programming at the National HBPA Convention at Sheraton Sand Key Resort, Hamelback shared his vision for a program he has dubbed SARC: Stewards Advisory Review Committee. An accredited high school football official, he likens the concept to the NFL adding replay booths to assist the referees on the field. The idea is to provide more information to make sure the right call is made, though SARC would not be making official rulings but only provide input and context to the stewards before they make a decision whether to issue a ruling, if so what it might be or to take no action. “I see this as a proposal to establish a public and private collaboration that would function as a resource for review, interpretation and support for stewards,” he said. Hamelback said the advisory committee could counsel on three areas: policy, practice and analysis. “The members of the SARC would represent a cross-section of regulatory officials, equine veterinarians, equine pharmacologists and equine toxicologists who are recognized as leaders in their field,” he said. “Obviously we want to ensure our industry’s integrity, and it’s essential for all our equine testing to work properly. The critical task of determining the validity of the test result should be to those who are, and have been, working in and understanding the legal and technical issues involved. Hamelback said the objective is to emulate programs already found in human testing. “The decisions made on these findings are as critical as the decision itself,” he said. Under the still-developing concept, the SARC members would review the findings sent to them from a requesting body seeking possible next-step procedures. Hamelback stressed that SARC would have no regulator authority. “This is a back-up for your stewards, that if they have a question, if they have something that they find and they don’t have a precedent, this group could be a great advisory resource for them,” he said. “This is not something we have currently. Hamelback will make a similar presentation at the Association of Racing Commissioners International meeting in early April. 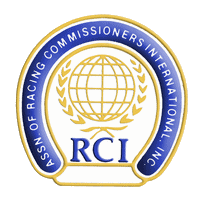 He said ARCI president Ed Martin is among those who have seen his proposal “and he feels it does have very good merit.” Hamelback said he hopes “in the very near future” to present a proposal to the education committee of the Racing Officials Accreditation Program. Hamelback’s presentation was part of the Kent Stirling Memorial Scientific Panel, an annual convention component named in honor of the longtime executive director of the Florida HBPA who was a relentless advocate for horsemen and leading authority on racehorse medication issues before his 2017 death. During Friday’s discussion, horsemen were cautioned against using CBD oil for or around horses as well as stall bedding made from tulip poplar trees. Dr. Clara Fenger, a veterinarian and PhD who founded the North American Association of Racetrack Veterinarians, said that, while common and economical, horse bedding made from poplar trees could trigger the presence of the alkaloid Glaucine, an antitussin and cough suppressant. Fenger said Glaucine also is found in other natural sources, including a tree that is the source of anti-diarrhea products used in horses and the Chinese herb yunnan baiyao used to treat bleeding. Fenger said that Glaucine in trace levels has very limited ability to influence a horse’s performance but a violation brings the second-highest Class B penalties under the ARCI guidelines routinely adopted by racing jurisdictions. Fenger said the increase in hemp use and production, including CBD oil and stall bedding, can be problematic for horsemen. She said the World Anti-Doping Agency has not classified CBD, considered by many as a good alternative to anti-inflammatories, and its presence in human testing won’t trigger a violation. The Racing Medication and Testing Consortium late last year recommended a Class 2 violation and Class B penalty for cannabidiol, which is commonly known as CBD oil. Dr. Thomas Tobin, the University of Kentucky pharmacologist and veterinarian who is one the country’s foremost authorities on equine testing, warned of the potential for environmental transfer of the amphetamine Aminorex that is present in the common pasture plant known as Yellow Rocket. The panel also included Dr. Wayne Duer, a chemist, mathematician and statistician who has worked in forensic toxicology for 40 years, including in horse and greyhound racing. Duer said the statistical methodology being used in setting racehorse drug and medication thresholds can leave too many people falsely accused for certain substances. He detailed what he finds as more appropriate mathematical methodology that should be utilized. The convention ends Saturday with the full board meeting. Next year’s National HBPA Convention will be March 24-28 in Hot Springs, Ark.